Note - this page has been updated to reflect 2019 One Monthly Goal sponsors and guidelines. To review One Monthly Goal 2018 sponsors and guidelines, please view this page. Select ONE of your creative goals for the month that uses fabric, thread and / or yarn. This could be to make a few blocks. cutting fabric for a project, sewing on a binding, or finish a quilt top. Any goal that involves a step in the process of making with thread, fabric or yarn is a valid goal. Then come post again at the end of the month to share your accomplishment in the One Monthly Goal Finish Party. The finish party which will run for 6 days at the end of the month. Each month, there will be random drawings from those who joined both the finish link-up and the goal link-up and those lucky winners will receive a prize from our sponsors! 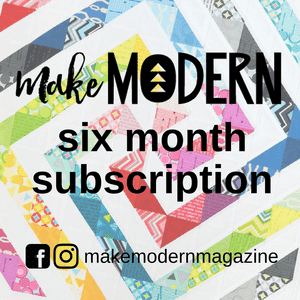 Fat Quarter Shop, Make Modern Magazine and Aurifil are returning again this year as sponsors. I truly appreciate their continued strong support of our link-up event! 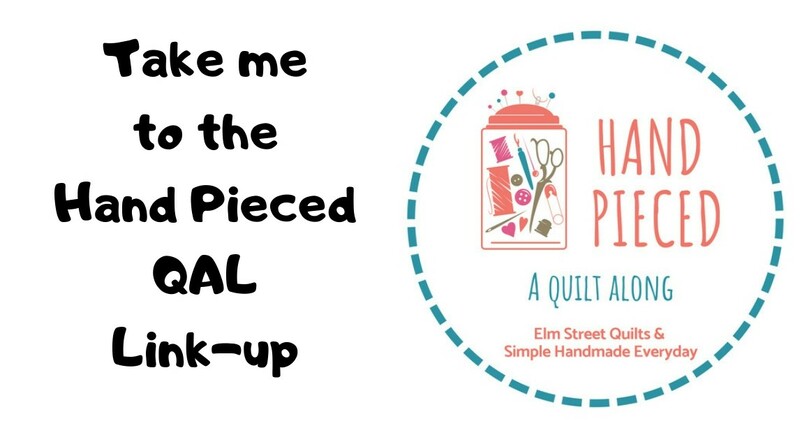 New this year, we've added The Quilter's Planner, Paper Pieces, Precision Quilting Tools and Put a Quilt on It as sponsors. 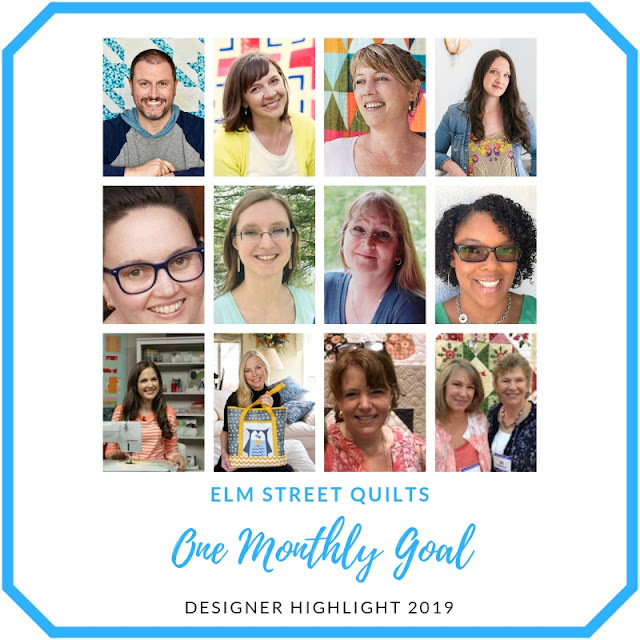 In addition, each month a different amazing quilt pattern designer will be featured and will be supplying a prize from their pattern store for one lucky winner. You must linkup for both the goal setting party and the accomplishment party, following the guidelines (including social tags and links) for your blog post, Instagram or Flickr. Participants are welcome world wide! Once winners have confirmed, the Finish Party post will be updated to announce the winners. You can find links to each of the link-up below. Note all linkups close at 11:55pm EST on the last date listed. Grab a button & help me spread the word! Ok, good to have ypu help out Heidi. What a fun Button. I will be linking up later this week. Thanks for taking over the monthly goal. I've already changed the button on my blog and linked up again. Hopefully, I'll actually get it done this time! Patty, thanks for taking on this role. I just found OMG in October and plan to use it each month to get a project done. I want to post from IG instead of flickr. So does that mean if I use the # and @ from IG I don't have to post on the linkup page? I look forward to participating in 2017. Thanks for hosting. 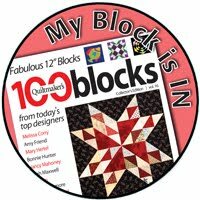 You did a fabulous job to keep up with the sampler blocks...way to go! I was too late to do the link up at the beginning of January. I hope I can figure it out for February. I have never done a Linky thing. Hoping this very old quilter can learn this new trick.8-) My 'word' for 2018 is 'Finish', so this would really help with that. I just found your blog and missed the first two months, but I will join up in March! Thanks! Well this month I am continuing on with last months goal to finish a quilt I am making for my husband.